GREATEST WOMAN RUNNER OF ALL TIME? Salty Running’s Greatest Woman Runner of all time, Tirunesh Dibaba. It was a close vote, but track superstar, Tirunesh Dibaba edged out Paula Radcliffe for the victory. A worthy victor, if ever there was one. Dibaba has several world records, including the 5k and 15k marks and owns the Olympic record and the second fastest time ever run for the 10,000m. She’s one of a handful of women to go sub-30 in the 10k. She was the youngest athlete ever to earn a gold medal at a world track championship when she won the 5000m in 2003 at the age of 17. She was also the first woman ever to earn back-to-back world championship and Olympic golds in the 5,000m and 10,000m. She’s known as the “Baby-Faced Assassin” because she tends to win her races with blistering fast last laps. She’s been known to drop a sub-60 final 400 in the 10k to decimate her competition! Her athletic accomplishments are many, but her personal story adds to her greatness. She grew up in a small town in Ethiopia in a family with several other accomplished runners. Derartu Tulu, who won the gold medal in the 10,000m in the Barcelona Olympics, is a cousin and her older sister was also an Olympian. Despite her family’s interest in running, she did not do much running as a child and did not intend to become a runner. Around the age of 14, her parents sent her to Adis Ababa to continue with her education, but she missed the registration deadline by a few days. Instead of returning to her small town where she would likely be expected to marry and have children in her teens, she joined a running club and the rest is history! 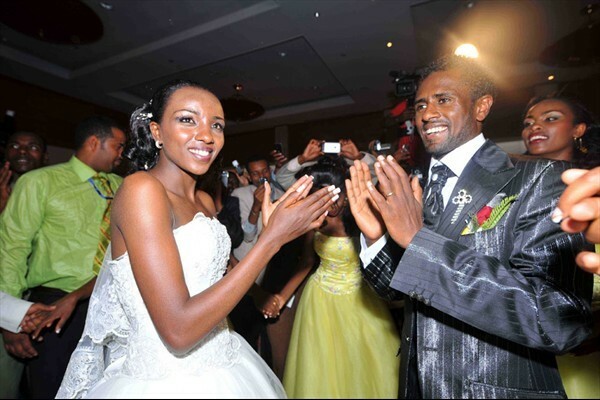 Dibaba and Sihine at their 2008 wedding. Image from Ethiopian wedding site, mushirit.com. Today, she is married to fellow Ethiopian Olympic medalist and 10,000m specialist, Sileshi Sihine. There is a hospital named after her outside of Adis Ababa and a hotel named after her is set to open this year. After winning the Olympic gold at the 2012 Olympics and the bronze in the 5,000, Dibaba was focusing on the 2013 London Marathon, but pulled out a month earlier with an injury. Her marathon debut remains highly anticipated!